Well it’s been a great few months at Sweetwater for our feathered friends and those who love to see them! The Blue-faced Parrot Finches continue to call Sweetwater home between the months of April and August often sighted in the grasses from the verandah of the second lodge as well as other favourite spots on the property. 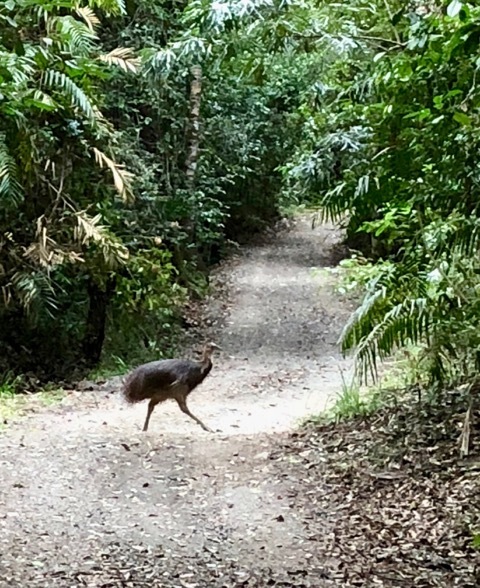 Back in June a young female Southern Cassowary was seen and photographed strolling through our rainforest track. And also very exciting was having the Little Red Boobook roosting in our tractor shed for a week or so at the end of September/beginning of this month. The Tooth-billed Bowerbird was also sighted in our private rainforest. The Double-eyed Fig Parrot has had a captive audience with our birding guests as they feasted on a fig tree near the lodges. Sweetwater not only offers outsatnding accommodation with a very warm welcome to our guests but excellent birding opportunities right here on the property. Situated right here in Julatten, QLD one of the birding capitals of Australia, we are in an ideal position to explore all the very best birding spots in the region. As your hosts we are very happy to book half and full day bird tours with one of our highly knowledgeable local guides. Our accommodation is self contained with a very well equipped kitchen. However breakfast and dinner hampers are also available and there are local pub options for those wishing to eat out. Please enquire for further information. Wet season visits are also encouraged for our birding guests as this is prime time to see the highly sought after Buff-Breasted Paradise Kingfisher.